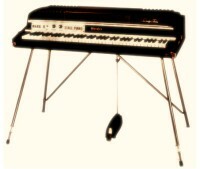 This article was published on Speakeasy Vintage Music’s website as an introductory piece for what was going to be an ongoing series of articles about Rhodes Electro-Pianos. It provides and example of my writing style when addressing technical matters to the layperson. 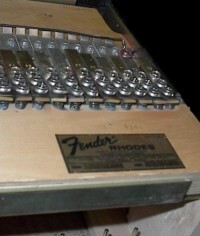 When talking about older Rhodes™ pianos, owners often use a mix of terms which may or may not tell a technician what they have. Worse yet, they may use terms that give the technician the wrong impression of what instrument is being discussed. In the interest of helping clear things up, here’s a guide to the various models, their names, and the assciated terms used to describe them. 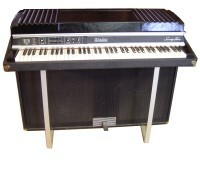 To the left is an example of a Rhodes™ STAGE piano. In this case a 73 note model. ALL Stage pianos can or do stand on 4 legs as shown. Most have passive electronics, but a few don’t. The passive electronics take the form of a volume control and a tone control. The tone control is usually a “Bass Boost” knob, increasing the bass response as it’s turned clockwise, but some early units have a “Tone” control instead, which increases treble response as it’s turned clockwise. The ones that have active electronics requiring external power, are either one of several aftermarket preamps that were available over the years OR they have a Rhodes™ suitcase preamp. Those that have a suitcase preamp can be confusing, since if you set a SUITCASE piano and a suitcase preamp equipted STAGE model side by side on a table, they’d be impossible to tell apart. The key is to look for those screw in leg mounts under the piano. Why do some have a Suitcase preamp even though they are STAGE models? That preamp came as part of the Satellite Speaker System. A “kit” of sorts to make your STAGE model like a SUITCASE by installing that preamp and connecting it to a pair of external speakers. Unlike the true SUITCASE model the piano never sat on these speakers, they were placed to the sides while the piano remained on it’s screw in metal legs. Suitcase models are a bit more complicated. While all have the common traits of having a built in preamp – which can be easily spotted by a multi-pin connector (more on that later) as well as Vibrato controls, and bass and treble tone controls. Some are now living the single life, orphaned from their accompanying lower cabinet which contains their power amplifiers, power supply, speakers, and sustain pedal. The thing that often presents it’s self as a complication is that multi-pin connector I mentioned earlier, along with more obvious “Jordon” version which was the first and uses a run of the mill TRS cable to connect the two cabinets, there are the “Peterson” version which sports a 4 pin connector, and the “Janus” version which uses a 5 pin connector. All Petersons 1 faux concentric knob for volume, and 2 true concentric knobs. One of these double stacked controls handling bass and treble, and the other vibrato speed and depth. Janus models usually have 2 sliders for Treble and Bass and regular knobs for everything else, but there are some late ones that have round knobs for ALL their controls. Of course if you are lucky, none of this is needed. You’ll find a readable (often they aren’t) builder’s plate on the player’s side of the treble end of the “harp”. There you can also find the encoded date your piano was built. It is presented as a rubber stamped 4 digit number, where the first 2 digits are the week of the year, and the last 2 digits are the last 2 digits of the year. Therefore, if you found a number like 5077 there, that would be the 50th week of 1977. You may find other 4 digit numbers in the same general area, but when they are present they are combinations that can’t be the date. …the man who really counts in the world is the doer, not the mere critic-the man who actually does the work, even if roughly and imperfectly, not the man who only talks or writes about how it ought to be done.